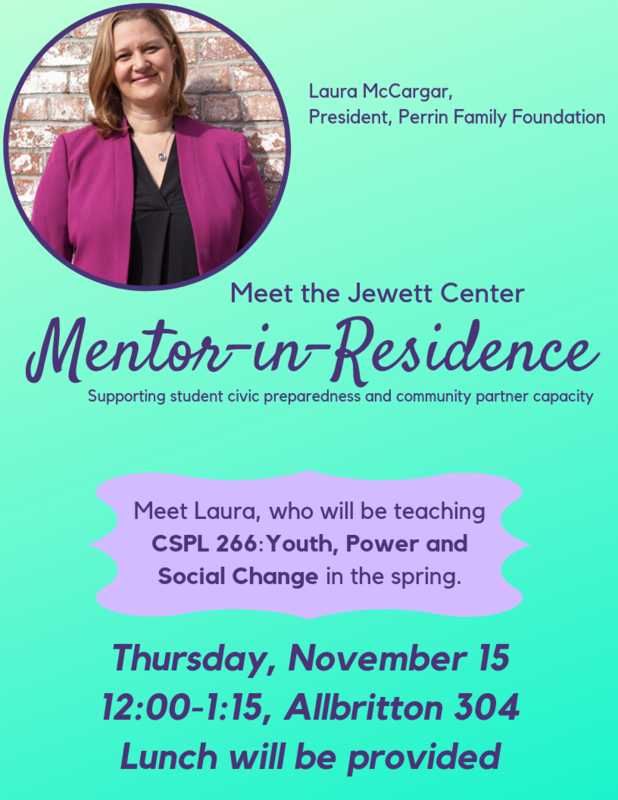 Please join us as we welcome Laura McCargar, the JCCP’s inaugural Mentor In-Residence! 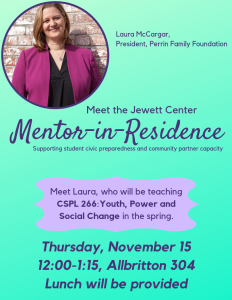 Learn more about the Mentor In-Residence program and Laura McCargar during a Welcoming Reception on Thursday, November 15th from 12:00-1:15 pm in Allbritton #304. Lunch will be served. Please RSVP no later than Monday November 12th by contacting swadlow@wesleyan.edu. Laura McCargar is the President of the Perrin Family Foundation which partners with organizations based in under-resourced communities across Connecticut in order to create environments that support youth as leaders of social change. Laura also serves on the board of the Funders’ Collaborative on Youth Organizing, a national organization that works to build a more powerful, well-resourced, and interconnected youth organizing field. In spring 2019, McCargar will teach a .5 credit course in the Allbritton Center for the Study of Public Life entitled: Youth, Power and Social Change, which will explore the 1990s popularization and rise of the field of youth organizing as an intentional strategy for transforming youth, communities, and the broader social and political structures and institutions that shape their lives. This course will examine the evolution of youth organizing, the politics of power and identity in youth work, and the role and impact of youth-led social change in our current political climate. In addition to teaching, Laura will work with students and community partners around her expertise via a series of lectures and public workshops during the spring 2019. You can learn more about Laura McCargar here.